Development that began sprawling through rural America in the 1970s hit western Massachusetts with a proposal to build a Wendy's restaurant on farmland in the city of Greenfield. Kathleen Merrigan can't forget fast food's planned arrival in her hometown. Her schoolteacher parents rallied the opposition. "[My mother] had a slogan: Stop Hamburger Highway!" Merrigan recalled in an interview. "I sort of lived through that whole issue around farmland preservation." The fight for local farms laid a foundation for Merrigan's career. Dubbed the "mother of organic" by Time magazine in 2010, the former second in command at the Department of Agriculture promoted locally grown, organic foods decades before the terms entered the average grocery shopper's parlance. Before writer Michael Pollan promoted sustainable food in his 2006 book, "The Omnivore's Dilemma," Merrigan was talking up organic and local foods in the halls of the Capitol and USDA. Kathleen Merrigan helped pave the way for the recent success of the organic industry. Photo by Jessica McConnell Burt, courtesy of The George Washington University. Those efforts have paid off. Sales of certified organic goods have hit record highs, growing nearly tenfold since 2004. The industry is on the cusp of creating its own "checkoff" program to raise funds for advertising and research, putting it on par with the large commodity-backed entities that created the "Got Milk?" and "Beef: It's What's for Dinner" campaigns. As a staffer for then-Senate Agriculture Chairman Patrick Leahy's (D-Vt.) office, Merrigan helped craft the 1990 Organic Foods Production Act. In 1999, she came to USDA to head the Agricultural Marketing Service -- which administers the National Organic Program -- and eventually rose to the post of deputy secretary before leaving in 2013. Before coming to Washington, she worked for a Massachusetts state senator, for Texas' agriculture commissioner and as an academic at Tufts University. 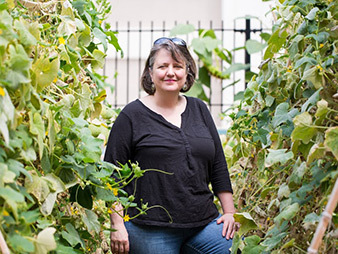 Today, Merrigan, 55, heads the sustainability office at George Washington University and co-chairs AGree, a think tank on food policy. Her husband, Michael Selmi, is a civil rights and employment law professor at George Washington. They have two teenage children, a 16-year-old daughter and a 14-year-old son. She and Selmi were set up by Tom O'Brien, a former USDA official and food industry lobbyist who is now senior vice president at Driscoll's, one of the largest sellers of berries in the country. Merrigan is an agricultural policy workhorse who calls the public policy arena her "playground." Her public manner is playground worthy. She speaks with a relaxed cadence. Her humor flashes self-deprecation; she recalled in an interview a New York City cocktail party in which she spent the evening talking about the 1990 farm bill and then fell asleep in a corner by the end of the night. Her colleagues describe her as "systematic," "methodical" and "tireless." "She kind of came in with this sort of no-nonsense leadership," said Suzanne Palmieri, Merrigan's chief of staff when she was deputy secretary and now an associate administrator at USDA's Foreign Agricultural Service. As USDA's second in command, Merrigan was asked by Agriculture Secretary Tom Vilsack to spearhead the agency's efforts on local and regional foods, which grew into the Know Your Farmer, Know Your Food program. Though serious about her work, Merrigan is known for being spontaneous and unconventional. At a local-foods meeting, for example, Palmieri recalled Merrigan quickly sketching a diagram of a local-foods strategy with boxes and arrows in lieu of a formal, bullet-marked PowerPoint presentation. "Sometimes I wanted her to be a little more formal," Palmieri said. "I knew I was going to lose that battle." Inside USDA, Merrigan fought her battles, said Mark Lipson, who was USDA's organic and sustainable agriculture policy adviser from 2010 until last year. There was an assumption at USDA, Lipson said, that the lack of genetically modified crops in organic agriculture meant farmers would struggle to prevent soil erosion because farmers practicing no-till agriculture often rely on biotech crops that resist the herbicide glyphosate. "That wasn't a priority for the agency to support organic agriculture. In fact, [it] was harmful," Lipson said. Merrigan's spontaneity and fight were why she was asked to join AGree, the food policy advocacy group she joined in March. AGree was launched in 2011 with high hopes and leadership from President Clinton's Agriculture Secretary Dan Glickman. "She was my choice from the beginning," Glickman said in an interview. "She's smart and very, very easy for me to deal with." There are few interdisciplinary organizations in agriculture policy. Some focus on specific crops, others tackle hunger and nutrition issues, others lobby for more research money for universities. AGree was formed to bring together the disciplines to form a more complete picture. But the generalist organization is struggling to distinguish itself in a landscape shaped by competing trade group interests, Lipson said. "From my perspective, I haven't seen all that much really come out of it, either in terms of actual substantial policy strategy or the meeting of hearts and minds from different corners of the agriculture policy spectrum," he said. Merrigan, he said, can help. "Kathleen is the kind of person who can really change that dynamic," he said, "because she really does understand and relate to and function well across the whole spectrum." Her organic badge has lingered. Republicans pointed to it in her 2009 Senate confirmation hearing for USDA deputy secretary, with then-Agriculture Committee ranking member Saxby Chambliss (R-Ga.) saying he had concerns that Merrigan's "passion for organic production and sustainable agriculture" could cloud her dealings with conventional farming. "Please keep a special place in your heart for organic production. Don't let that be diminished. But, also, be open to other types of production which gives all farmers options," Chambliss told her. "As deputy secretary at USDA, your job will not be to focus on your personal interests or promote one type of agriculture at the expense of the other. Your job will be to help run the department and its programs so that they work for all producers and consumers, all Americans." She's also been criticized in her own camp for opening the organic door to big companies. While the organic sector has grown tremendously since Merrigan's arrival in Washington, some argue it's grown too big, beyond the intentions of the Organic Foods Production Act. The arrival of large companies in organic production -- Coca-Cola, Kellogg, General Mills and many others have a stake with brands like Odwalla, Cascadian Farm and Bear Naked granola -- has compromised the standards, said Mark Kastel, senior policy analyst with the Cornucopia Institute, which has criticized the influence large corporations have played. "The execution [of the OFPA] has been abysmal" under the George W. Bush and Obama administrations, Kastel said. "I rest much of that responsibility at her feet." Kastel is especially critical of Merrigan's oversight of the organic program's National Organic Standards Board, an advisory committee for the maintenance of organic standards. The board was intended to be filled with farmers, organic retailers, environmental interests and consumer advocates. USDA, he said, has allowed representatives from large agribusinesses, a move that has influenced technical reviews and allowed questionable ingredients to qualify as organic. "That's the proverbial fox watching the organic chicken coop," Kastel said. The growth is intentional, and a good thing, according to Merrigan. Standards have not been watered down, she said. In fact, they've becomes stronger. She cited the 2010 access to pasture rule, which clarified some of the prior opaque rules around raising organic animals in an open, outdoor space. Where the organic sector has grown the most, particularly in meat and poultry production, regulations have followed, she said. "I've always wanted organic to grow," she said, "and become more accessible to people across the country."